A dear friend of mine just returned from Africa and brought me a wonderful gift: a literal bag of whole vanilla beans! Apparently vanilla beans are much less expensive in Africa (no doubt due to the vanilla bean powerhouse Madagascar) so thanks to my friend R I now own more vanilla beans that I thought I could bear to purchase in one go! Isn’t it great to have friends like that? Clafoutis are so simple to put together, that they’re a cinch to make even as a last-minute dessert on a chilly evening. 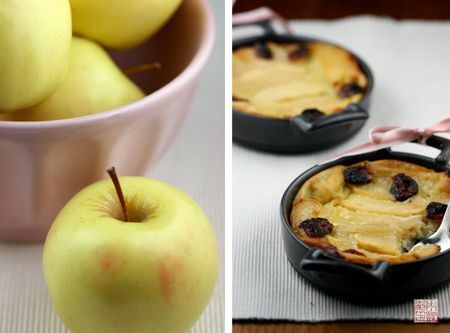 Clafoutis can be fantastically light and airy when made with summer fruit, but the addition of stewed apples gives it a downright cozy twist. I scraped the vanilla bean seeds straight into the skillet to infuse with the melting butter, and perfuming the kitchen at the same time. The vanilla-scented butter give the apples a warm richness (If you look closely, you might see specks of vanilla bean in the photos). The cranberries add the puckery bright counternote to keep the clafoutis from being one-dimensionally sweet, and also continues the fall theme. 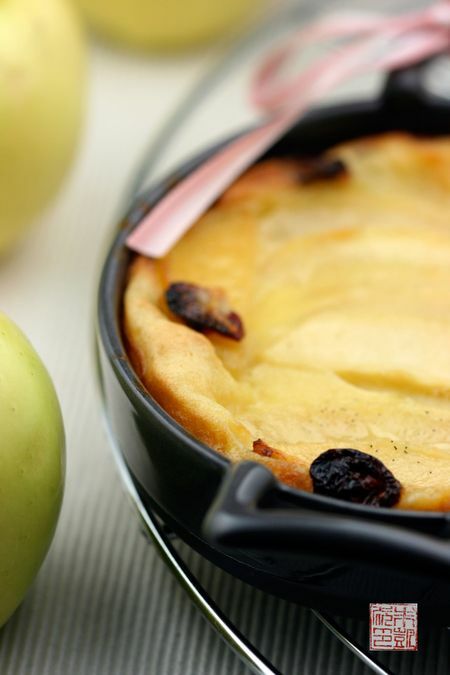 Although clafoutis can be eaten hot or cool, this one is definitely best straight from the oven, with a dollop of cinnamon-sprinkled whipped cream on top, maybe some mulled cider for accompaniment, and soft susurrus of autumn swirling outside the window. Preheat the oven to 400 degrees F. Grease 4 creme brulee dishes with butter and set aside. Whisk together the eggs, milk, and sugar in a medium bowl. Add in the flour and whisk to combine. Add in the vanilla and whisk to combine. Wash and peel the apples. Cut into 1/8 thick slices. Place butter in a medium skillet and melt over medium heat. Cut the vanilla bean open and scrape the seeds into the melting butter. Swirl to combine. Add in the apple slices and toss to coat. Sprinkle the sugar over the apples. Cook for about 5 minutes until the apples have softened. Fill each of the creme brulee dishes about halfway with the clafouti batter. Divide the apple slices among the dishes. Do not overfill, about 8 slices or so should be fine. Sprinkle some of the cranberries on top. Fill the creme brulee dishes with the rest of batter, to a little below the rim. Place in oven and bake for about 20-25 minutes, until the clafoutis have puffed up, the edges are golden, and the centers are just set. Do not overbake. Remove from oven and let cool for a couple of minutes before serving. You can top with confectioners’ sugar or whipped cream if you like. I am having major seasonal envy! This is a beautiful dessert and a great combination of flavours. I’ll have to try it next autumn! All I need is a spoon. What a wonderful description. Great pictures, This looks wonderful. I’m going to give it a try. Thanks for the recipe! I love those baking dishes! they’re gorgeous! 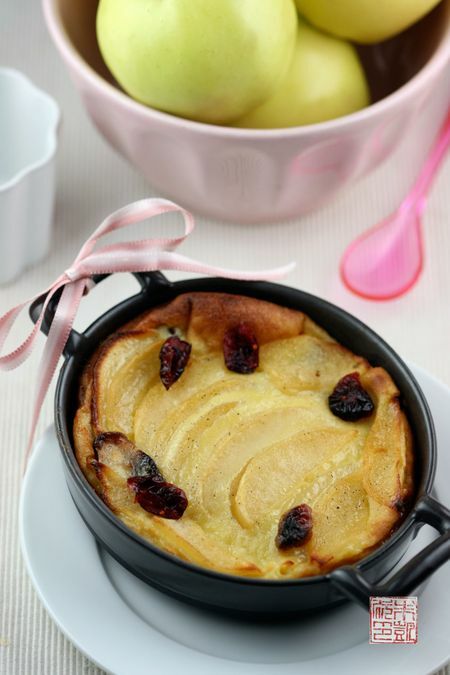 The combination of apples, cranberries and vanilla bean for a clafoutis sounds perfect for fall! yum! I’m descovering your website and I love it. These look just perfect and so comforting. I’ve been on a dried cranberry kick lately and these play right to it. I love your little baking dishes! This looks perfect to indulge in, on a rainy, cold afternoon! (and easy to make!) BTW, I absolutely love your Field Guide to Cookies- can’t wait to get the candy book when I come to the States this Christmas. I’ve been following your blog for a while now and it is very inspiring! Tried this recipe yesterday and my roommates and I loved it! So autumny and delicious. Apples and cranberries, the perfect fall dessert! Just browsing the web then landed on this post. I was amazed on your recipe! Perhaps I could try this one! It really looks delicious and very presentable in special occasions. Thanks for sharing this! Very perfect! This sounds absolutely perfect! I love the flavor combo, and couldn’t imagine a cozier dessert for these chilly fall evenings! This is a very nice recipe. I love vanilla I love this recipe.